After moving into an empty apartment, I was in need of furniture. On Saturday, I went to the Ikea store in Round Rock. I noticed some white matter on the rear door on the passenger side when I came out. Since I scraped it off with finger nails, I didn’t give it any more thought and went ahead to load the furniture. 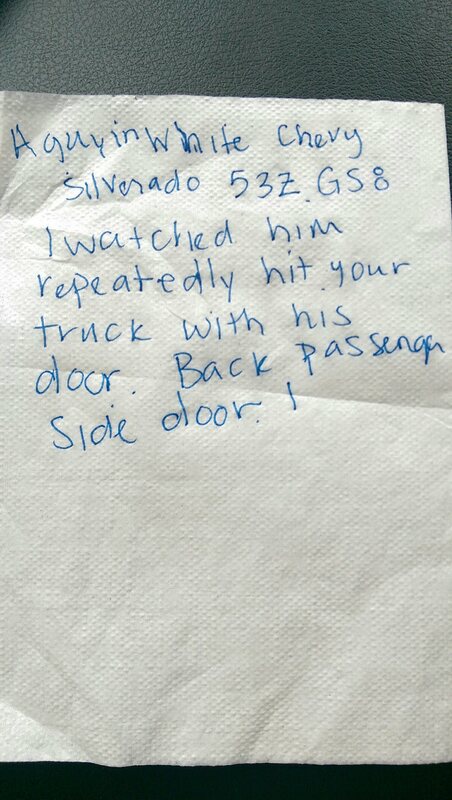 As I was getting into the truck I saw a napkin inserted under a wiper. I went back to the door and looked much more closely. Fortunately, I did not find any visible damage. Sent the note to a friend of mine living in Dallas. Here’s his response, “Damn rednecks! At least some one turned them in. Hope things improve for you!” I was somewhat conscious of the New Jersey license plate on my truck and was more careful than usual like not parking diagonally and leaving enough space on both sides. People are not subtle in this part of the country. My kind of town! Like it already. Is Racial Bias Genet… on Indoctrination or Culture?